You may remember my last post described a conversation overheard in a local consignment shop. I’d gone there to take pictures of a small bronze sculpture depicting one of the more salacious episodes of Greek mythology: Leda and the Swan. In the myth, Zeus disguises himself as a swan in order to seduce the Spartan queen, Leda. Leda conceives the twins Helen and Clytemnestra, thus leading indirectly to both the fall of Troy and the murder of Agamemnon. It’s a story of sensuality and of deception. And so is this little bronze, because it’s a blatant copy of the sculptural work of Colombian artist, Fernando Botero (b. 1932). Botero is usually the only South American artist whom most Americans can name even if they are unfamiliar with Latin American Art generally. And if they can’t actually name him, they can ask, a little sheepishly, “is he the guy who paints the really fat people?” Yes, that’s the guy. I always found Botero’s claim that his corpulent figures were intended to evoke classical volumes a little, um, thin. But then I got to know his bronzes and suddenly the weight and solidity of those hugely voluminous forms made sense. The massive shapes (I once had to install a special plate under one of his titanic horses to keep it from crashing through York Avenue) come alive for me in a way that his more famous paintings rarely do. And the table-top sized miniature versions have a grace and charm that make them really irresistible. 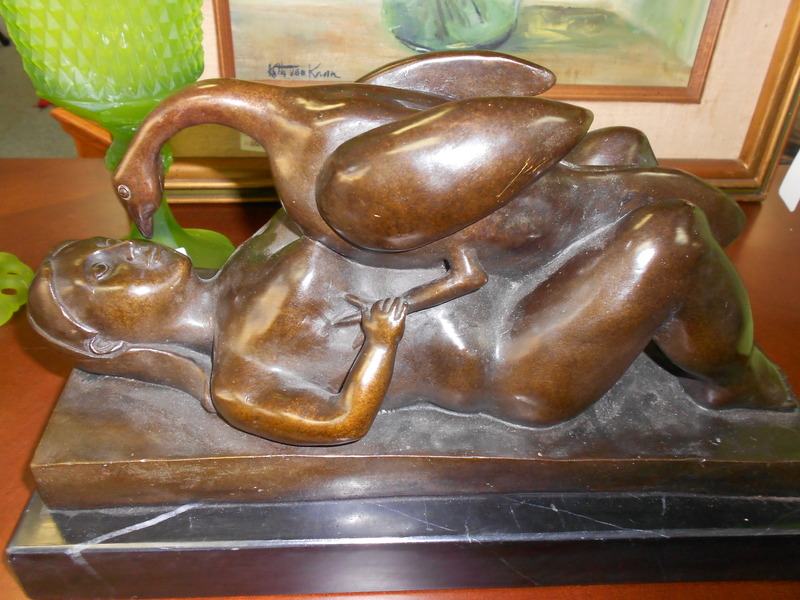 Since the 1990s Botero has done at least three versions of the Leda theme, including the one from which our example was copied. 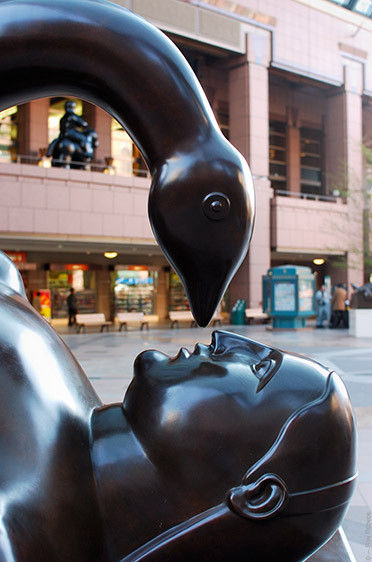 A real Botero Leda, exhibited at Ebisu Garden Place, Japan. Photo credit: Ron Reznik. The fake Leda, photographed August 5, 2012. In auction catalogues and on eBay this type of deception is couched in euphemisms like “style of,” “after,” and “tribute.” But it’s still an attempt to profit from another’s artistic originality and intellectual property. It may not be enough to launch a thousand ships, but it’s still an attempt to seduce and deceive. Consignment Shop Copy: $325, as marked. 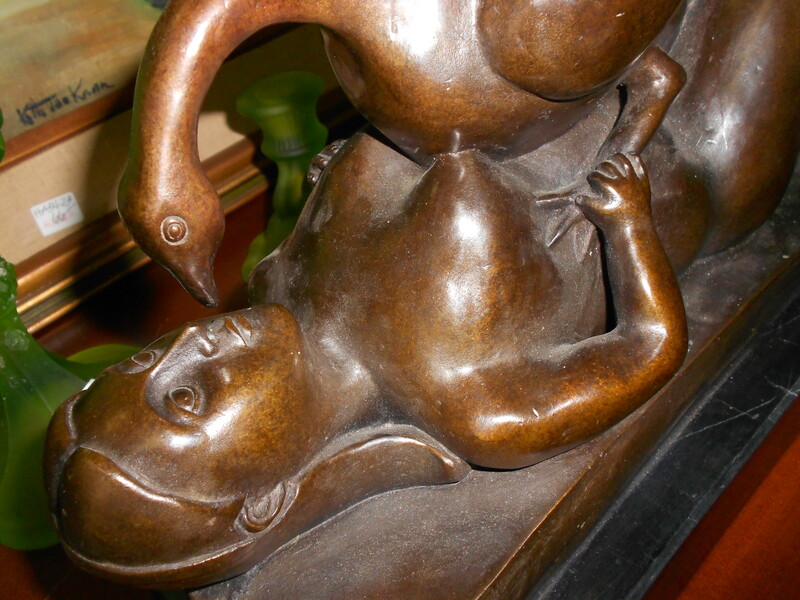 The Real Thing: in 2011 a large botero bronze sold for almost $1.8 million. A small one with these approximate dimensions might bring around $175,000 at a major auction house like Christie’s or Sotheby’s.